Arthur James Andrus "T-Boy" with WH Design By Dash and HH Kentucky Krome. SHELBYVILLE, IN—SEPTEMBER 12, 2018—There are many people at Indiana Grand Racing & Casino that may not recognize the name Arthur James Andrus, but almost everyone knows the name "T-Boy." Andrus picked up the nickname "T-Boy" at a young age and the groom is now a well-liked fixture in the Quarter Horse barn at Indiana Grand. Born in Lafayette, Louisiana and raised nearby in New Iberia, Andrus first came onto the scene as a youngster, known in Cajun French as petit garcon, which eventually became "T-Boy." He started riding horses at seven and would walk over and help a trainer in a nearby barn. Eventually, that walk turned into the trainer putting him on a pony and then onto a racehorse. At the age of 11, he was riding at the bush tracks in Louisiana, winning his first six races in a row. After a short time in the saddle, Andrus was involved in a racing incident that left him in an iron cast from his chest to his hips and in the hospital for almost a year, which took him away from the horses. "I worked as a carpenter's helper and on the highway with my brother and even worked off shore for about a year, but in between all of those jobs, I always went back to the horses," said Andrus. "I came up to Indiana with Keith Angelle in the late 1990s and stayed and worked for Bonnie Fuller. This has become my home. I haven't been back to Louisiana in 11 years now." Word spread about the hard work and dedication "T-Boy" displayed and he eventually landed a job with Trainer Ron Brown, a spot he held for six years with great success. "T-Boy" and Brown once won four races in one day. "We had all four in the test barn at the same time," recalled Andrus. "I have great respect for Ron. He is a very good person and we did well together." 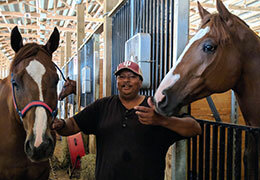 It would take a special situation for Andrus to get a job that fit him better, and that position came along seven years ago with Quarter Horse Trainer Paul Martin. "T-Boy" has watched many success stories come in and out of Martin's care over the years. One of the biggest success stories has been the powerhouse older sprinter WH Design By Dash, who recently moved into third among the richest Indiana breds ever behind Pistolpacking Pepsi and Stinkin Rich. In all, the Brimmstone gelding, now seven, has in excess of $423,000 with 13 wins in 40 career starts. "'Dash' knows when a race is coming up, he picks up on the little things and he knows," said Andrus. "I will stop and pull grass on the side of the road for him a few days before a stakes race and he gets four carrots every afternoon. But he doesn't like to walk too long on the wheel. About five minutes and he's hollering at me to come get him. I try to give him what he likes and I tell him all the time 'don't win for me, win for yourself; show them you still have it." At this point in his career, 'Dash' doesn't need to prove anything. The powerful gelding has a home for life with Martin and his wife, Julia, who have plans to use him as a family riding horse at their farm at the end of his career. Martin monitors the big chestnut closely and notes that they will let 'Dash' tell them when it is time to retire. "'Dash' is my big boy," said Andrus, who has worked with the horse his entire career. "I never really have a favorite and I treat them all the same, but I like 'Dash' and 'Kromie' (HH Kentucky Krome) awfully well." Andrus will be busy during the fourth all-Quarter Horse racing night Saturday, Sept. 15 as Martin has five in during the eight-race program, including HH Kentucky Krome, who has drawn post six in the fourth race. Andrus usually stays behind the scenes on busy nights, but he will make an exception Saturday. "'Kromie' is a totally different horse than 'Dash'," said Andrus. "He is scared of everything and sometimes you just have to tell him it is okay and go on with him. I generally stay behind in the barn and make sure all the horses are ready to go, but I'll bring 'Kromie' up to the paddock myself to race." There is rarely a time that "T-Boy" can't be found in the Martin barn working on horses, but he has developed a hobby outside of the track. He now raises and sells show pigs and currently has 35 under his care. But the main love for Andrus is the horses he cares for in the Martin Stable. "Paul (Martin) and his family are wonderful people," added Andrus. "They appreciate what I do and do things for me a lot. I'm just fortunate that I do what I love. Horses have been in my life forever and I just can't get enough of them."